The Capital One® Quicksilver® Cash Rewards Credit Card is a popular cash back credit card that pays a flat, unlimited 1.5% cash back rate on all purchases and doesn’t charge an annual fee. Like many fellow cash back cards, it boasts a nice early spend bonus, a special introductory APR promotion for purchases and balance transfers, and some other user-friendly perks. The Quicksilver Cash Rewards Card is comparable to a number of other cash back cards, most of which also lack annual fees. Popular alternatives include members of the Discover it family, Chase Freedom, Citi Double Cash, BankAmericard Cash Rewards, and American Express Blue Cash Everyday. Quicksilver is very similar to its Capital One cash back stablemate, Capital One QuicksilverOne Cash Rewards, which is easier to qualify for and offers similar cash back benefits, but comes with a $39 annual fee and higher interest rates. Compare this card to other cash back credit cards. When you spend at least $500 within 3 months of opening your account, you get a $150 cash bonus. The Capital One Quicksilver card earns an unlimited 1.5% cash back on all purchases, with no caps, restrictions, or tiered spending categories. You can manually redeem accumulated rewards in any amount for statement credits, gift cards, or paper checks. You can also schedule automatic redemptions that are triggered when you pass a specified cash back increment: $25, $50, $100, or $200. Capital One Quicksilver has a 0% introductory APR for purchases and balance transfers for 15 months. Qualifying transfers can be made at any time during the introductory window. However, Capital One doesn’t allow balance transfers from any other Capital One accounts, including merchant-branded cards (such as Kohl’s and GM) issued by Capital One. There is no annual fee or foreign transaction fee associated with this card. Balance transfers cost a flat 3% of the transferred amount, while cash advances cost the greater of $10 or 3%. The late payment fee is $35. You get free access to Capital One CreditWise, a useful collection of tools and content to help you build and stay on top of your personal credit. It includes a free credit score accessible in your account dashboard and visible on your monthly statement. 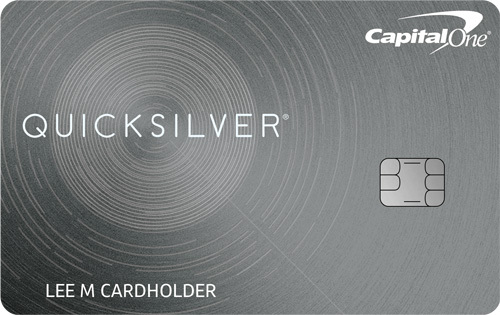 As a Capital One Quicksilver cardholder, you’re entitled to a number of general fringe benefits: 24/7 concierge service and travel booking assistance, 24/7 emergency card replacement for lost or compromised cards, and VIP/priority access to events such as sporting contests and special golf outings. This card requires good to excellent credit. Minor credit blemishes aren’t likely to be disqualifying, but major issues can cause problems. No Annual Fee. The Quicksilver card doesn’t come with an annual fee, which is a great help for cardholders who wish to maximize their cash back earnings. Some popular cash back cards (or cards that earn rewards which can be redeemed for cash) do have annual fees: American Express Blue Cash Preferred carries a $75 annual fee, while American Express EveryDay Preferred‘s annual fee is $95. Attainable Early Spend Bonus. When you spend at least $500 within 3 months of account opening, you get a $150 cash bonus. Intro APR Period Stretches 15 Months for Purchases and Balance Transfers. This card’s introductory APR period lasts 15 months on purchases and balance transfers, putting it on par with competitors such as Chase Freedom and Chase Freedom Unlimited and ahead of the Discover it Card. No Minimum Redemption Threshold. Although you need to have at least $25 in earned cash back to schedule automatic redemptions, you can manually redeem your cash back in any amount, at any time. No Spending Categories or Manual Activation Required. Capital One Quicksilver Cash Rewards earns a flat 1.5% cash back on all purchases. You never have to worry about keeping track of tiered spending categories or – even worse – manually activating quarterly rotating categories. Chase Freedom and Discover it both require you to manually activate cash back categories once per quarter. No Foreign Transaction Fees. This card doesn’t come with a foreign transaction fee. That’s great news for cardholders who want to maximize their cash back earnings while traveling abroad. No Penalty APR. This card doesn’t have a penalty APR. That’s great news for cardholders who occasionally miss payments, and a big advantage over Citi Double Cash, BankAmericard Cash Rewards, and American Express EveryDay. Free Credit Score and Credit-Building Tools. This card comes with a free credit score on-demand (and with your card statement every month), as well as a slate of useful credit-building and credit-tracking tools under the Capital One CreditWise aegis. This is a nice advantage over the BankAmericard Cash Rewards Card, which doesn’t offer regular credit scores or credit-building help. Rewards Accumulate at a Fixed Rate. The Capital One Quicksilver Card always earns cash back at a fixed rate of 1.5%. With no tiered spending categories (such as BankAmericard Cash Rewards‘ 3% gas and 2% grocery categories) or rotating 5% categories (such as Chase Freedom and Discover it‘s 5% quarterly categories), there’s no opportunity to earn more than the cash back baseline here. This could be a drawback if you concentrate your spending in specific categories that other cards reward more generously. Can’t Redeem for Merchandise or Travel. Capital One Quicksilver doesn’t let you redeem your accumulated cash back rewards for merchandise, travel, or other non-cash-equivalents. Thanks to Chase’s Ultimate Rewards portal, Chase Freedom lets you redeem for nearly anything that can be sold in stores or online. Requires Excellent Credit. The Capital One Quicksilver Cash Rewards card requires good to excellent credit. If you have any significant blemishes on your credit history, you’re not likely to qualify for this card outright. For a more attainable cash back rewards card, consider Quicksilver’s stablemate: the QuicksilverOne Cash Rewards Card. Just mind QuicksilverOne’s $39 annual fee. Chase Freedom is a nice no-annual-fee alternative. The Capital One® Quicksilver® Cash Rewards Credit Card belongs to a newer generation of cash back cards that emphasize simplicity, consistency, and accessibility. Think of it as a response or reaction to cards like Chase Freedom and Discover it – both great options that now seem a bit dated and quaint due to their continued reliance on rotating spending categories and other gimmicks. That’s not to say that the Chase and Discover cards have no place in your wallet – just that the cash back tide seems to be ebbing away from them and toward cards like Quicksilver. The Capital One® Quicksilver® Cash Rewards Credit Card has a flat cash back rate and simple, straightforward rewards that make it an ideal cash back card for people with varied spending needs. It’s not as useful for people who concentrate spending in a few favored categories, such as gas, groceries, or travel. This card’s relatively low fees, solid early spend bonus, solid introductory APR promotion, lack of a minimum redemption amount for rewards, and lack of spending categories. 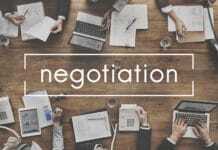 The somewhat limited redemption options, strict credit requirements, and the fact that there are no opportunities to earn higher rewards hurt its prospects. 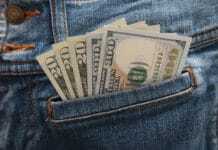 Overall, it’s a great cash back card for general spending.